Since the interview, JC has written a book (Charts Made Simple ) and and developed Stitch maps- which is a visual way of seeing how stitch patterns work. You can find JC online here, on Ravelry here, and her teaching schedule here. Jasmin has finished the Happy Howloween socks by Lollipop Yarn. Genevieve was Olivia , with a knitted Olivia hat. Gigi finished a pair of tube socks for Genevieve out of Neon Now. 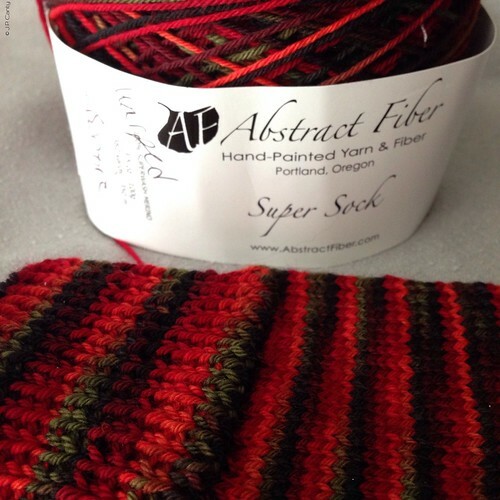 Jasmin is working on Stingy Jack socks (by Invictus Yarns) and she is going to make afterthought heels. She reminisces about the heels she loved throughout her knitting life: the flap heel from our Knitmore Vanilla sock pattern was the first heel she loved. Then she encountered Lucy Neatby's short row heel, then she got entangled with the stockinette short row heel, then went back to the flap heel. 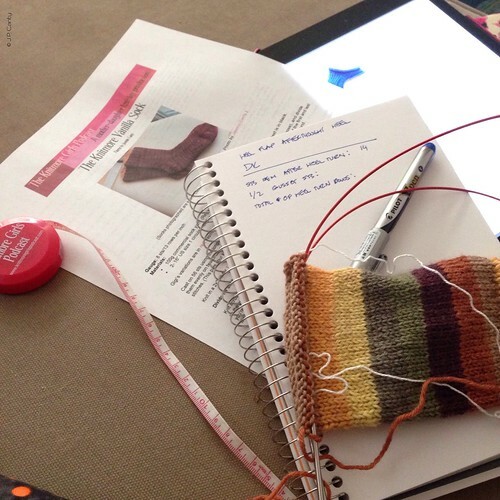 She cast on a pair of Regia Vanilla socks (Regia 6, colorway #6366) and is planning on doing an afterthought flap heel with a gusset out of the brilliant Sock Architecture book. Also, this yarn is dk weight and knits up in a flash. Simply Socks has this on sale. Gigi is not in love with her Van Gogh socks, and they may go live in Jasmin's sock drawer. 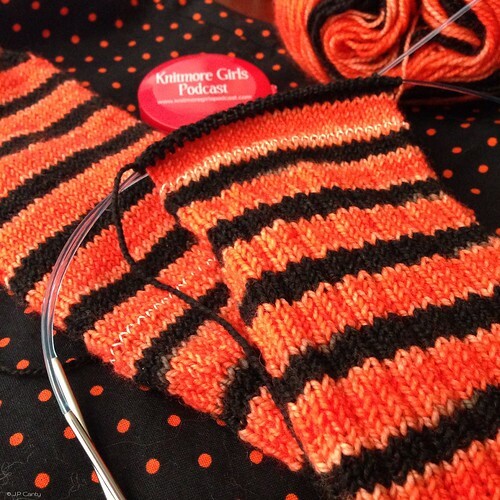 She is knitting a pair of Halloween socks out of Poste Yarn in the Elm Street colorway #operationsockdrawer. Gigi is working on the Wild Iris cowl from the Book of Cowls by Sivia Harding. She is knitting it out of Bijou Basin Ranch's Himalayan Trail in the "Sassenach" colorway #kiltmenowKAL. Correction for last weeks show notes: the Romi Hill boot toppers that we said didn't exist, have now been released! NaKniSweMo has started, and if you can, run it into SPAKAL, FFFWKAL, or #projectsweaterchest. We have started wearing knits: Jasmin wore her handspun Tangled Yoke, her handspun Seneca, her Breezy cardigan and Mondo Cable cardigan. Genevieve wore her matching Mini Mondo Cable cardi. Gigi wore her Cassidy, and Cat Bordhi's Coriolis socks . Gigi also wore her red mohair Oat Couture Spiral Petal Shawl. We were going to talk about the solution to the bleeding issues of the Regia Fluormania. Jasmin mentions the Addicted to Sockknitting Group, and refers to the Citric Acid fix. Let them know about the problem, and ask what the next step is. The winner for Operation SockDrawer for this episode is : FreckledCrafts, who wins a skein of Lollipop Yarn in the Kodachrome colorway. We announce the Grinch-along. Starting date is November 10th. Cease and desist all holiday gift knitting! #grinchalong. Knitting only for personal pleasure. 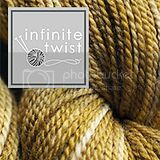 Take pictures and post them in the ravelry group and/or on Instagram. Grinchy fabric. Let us know what fun holiday things you are doing instead of gift knitting. Today we talk some more about an efficient closet. Today's focus is on shoe storage. We like things from the Container Store. Jasmin talks about the closet that Andrew built for her, and the accompanying blog post. Jasmin talks about information gleaned from a class with Rick Mondragon. She mentions Abby from the Knit Knit Cafe, and Doc Martin boots, and her Namaste bag. We would love to hear your thoughts in the episode thread. This week we are purloining "Today's Sweater" from Brenda Dayne's podcast Cast-On. We bid her a fond good bye and wish her success in all her future endeavors. She just announced that she cast off her last episode. 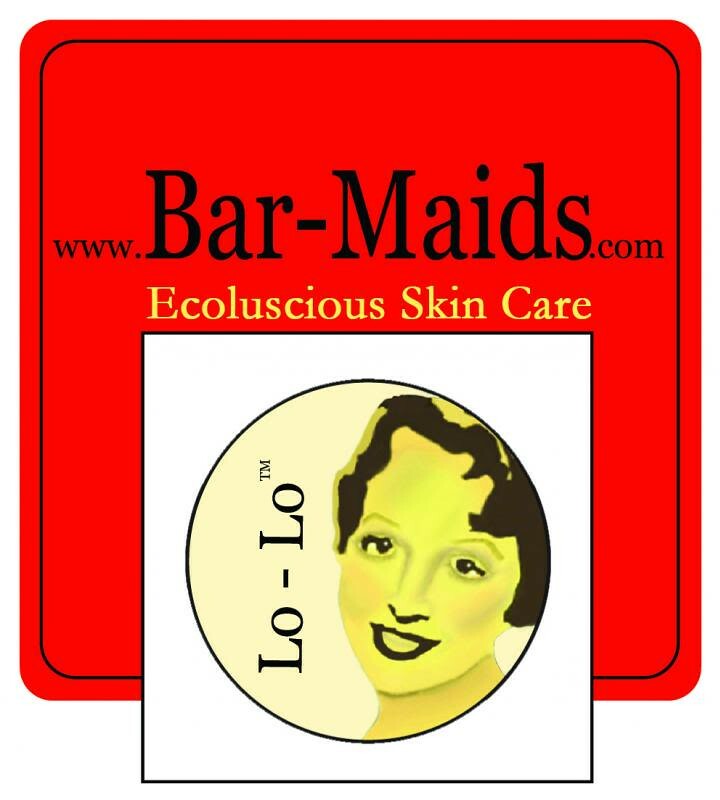 You may want to send her a personal message on her website. 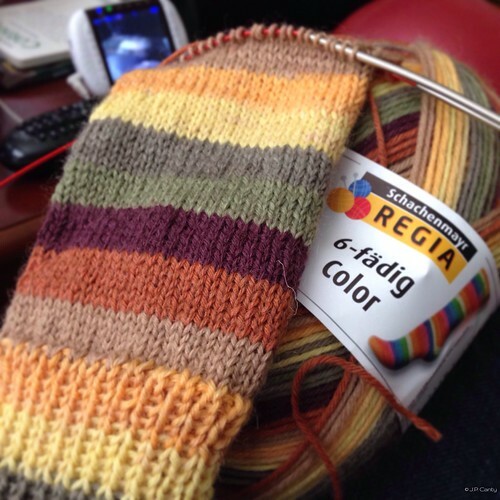 Jasmin talks about her first sweater for herself, a Penny Straker design of Cascade 220. This week we review Charts Made Simple , by J.C. Briar. 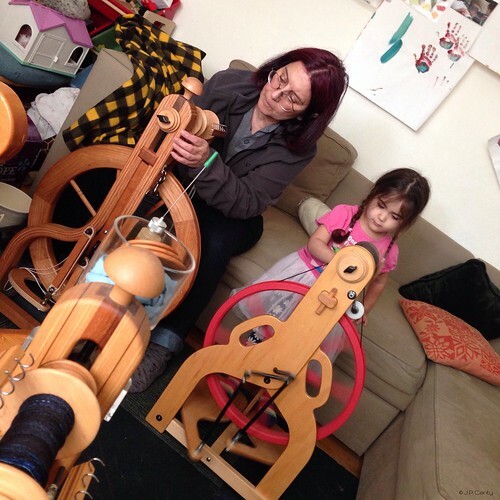 Gigi has gotten into the routine of pulling out her spinning wheel and is getting more work done. Jasmin is convinced that she needs a nutmeg colored sweater and she dug out a fleece that she had purchased from Janet Heppler of Nebo Ranch, and is swatching for spinning. Jasmin is excited to sew project bags, inspired by the lovely Erin Lane bags. We are using a bag tutorial that is also on Pinterest. She loves her Featherweight. Gigi was going to sew buttonholes on Genevieve's summer dress, and she had bought a Janome buttonhole foot, and was missing a manual. She also has misplaced the manual for her fancy Singer, and so couldn't do buttonholes on that machine, either.